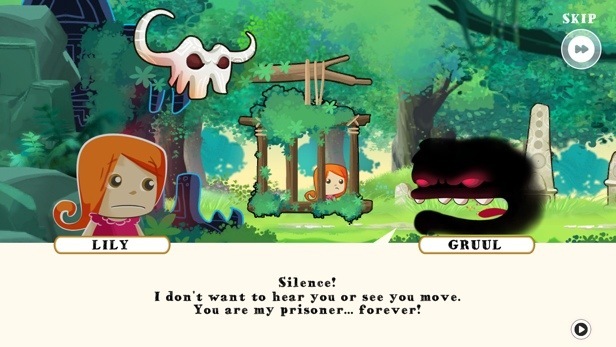 The Gist: You play as Lily, a little girl whom you can assume has been captured by a ghostly blob named Gruul and trapped in a cage in where? Yup, the amazon. It just so happens your “cell neighbor,” Splash, has a way to bust you out. So what happens after? Well, you run, of course! 1) Appearance: 1/1; The artistry revolves around a friendly, cartoonish overtone. Graphically speaking, there aren’t any pixels jutting out of place. 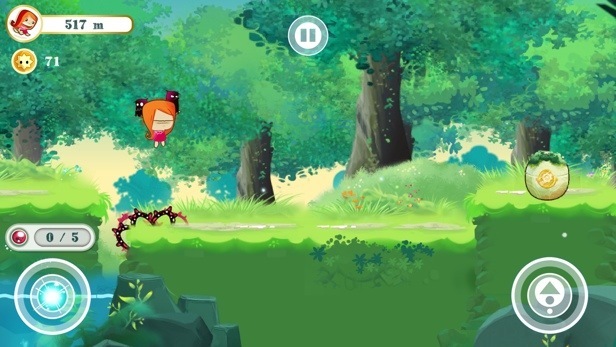 For a 2D side-scroller, the landscape, character motions, and enemies are all very smooth. 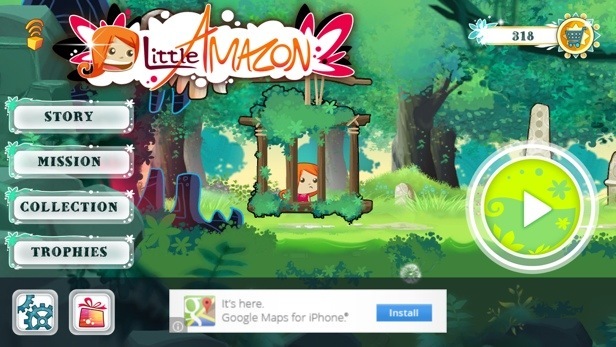 Precision is key for absolute beauty, and based on the theme that was chosen for Little Amazon, Bulkypix nails it. 2) Audio: 0.3/1; Where visuals leap to refine the gaming experience, audio suffers immensely. In a word, I would have to say Bulkypix has blatantly neglected this important sense. There is no speech, and there are little to no text to relay story information, except for the brief scenarios found at the beginning. 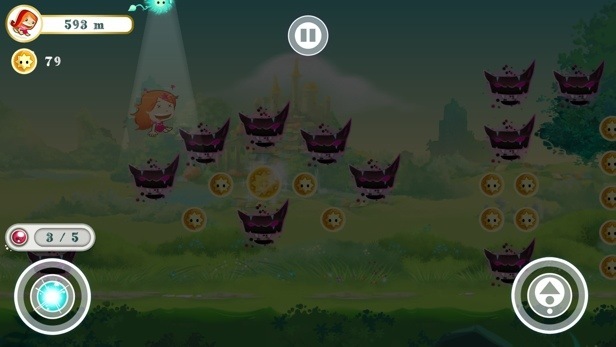 The only presence of sounds resides in the same musical track that spins on a continuous loop while you dash across the field, mixed in with some occasional sounds made by your enemies and the spell you cast to destroy them. 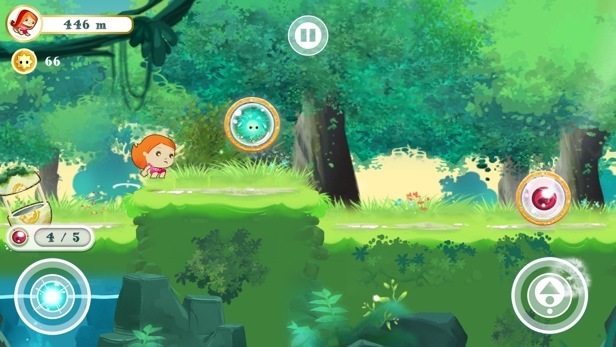 3) Playability: 0.5/1; There’s nothing too complicated with Little Amazon, especially in the parameters of the endless runner genre. You run, you jump, you dodge, you hit a baddy or two, and that’s it. 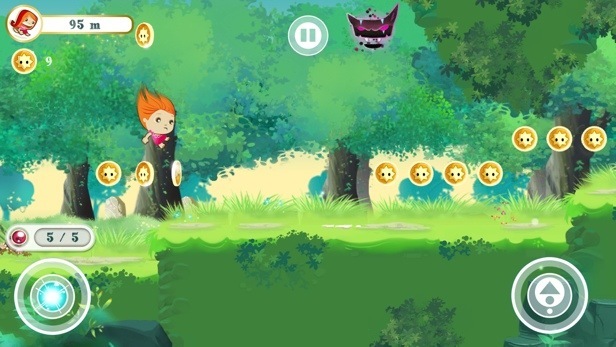 A good endless runner, like Polara, will kick the pace up so the player has to remain alert and focused to survive. The main reason you’ll fail in Little Amazon is because the boredom can set in before the pace reaches an exhilarating rate. 4) Stability: 1/1; Gotta give Bulkypix an A for affort on this one. 😀 All I witnessed were smooth frame rates and zero bugs or glitches. Based on the complexity of this game (or lack of), I wouldn’t expect any real problems. Little Amazon is a straight-shooter. 5) Value:1/1; Regardless of quality, free is a hard price to argue with. Considering Little Amazon’s minor flaws, however, Bulkypix has provided a well-budgeted waste of time, indeed. iOSA3 Rating: 3.8-/5; Although Little Amazon rated decently in the A3 number brackets, the overall gameplay was pretty mediocre, especially in comparison to some of Bulkypix’s other more addictive titles. 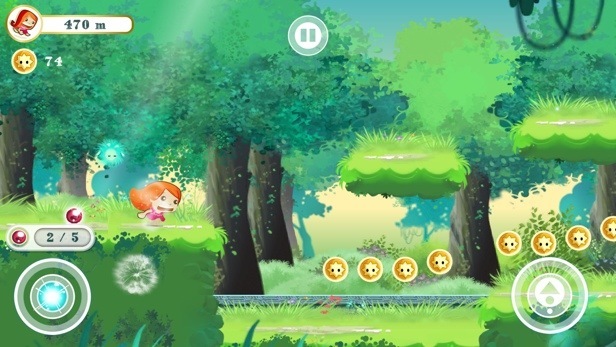 The speed at which the character runs is lethargic for an endless runner, turning Little Amazon into a boring child’s game with intentions of enforcing the player to commit to the same mundane task again and again: run, dodge, attack. There’s not a lot of variative imagination! 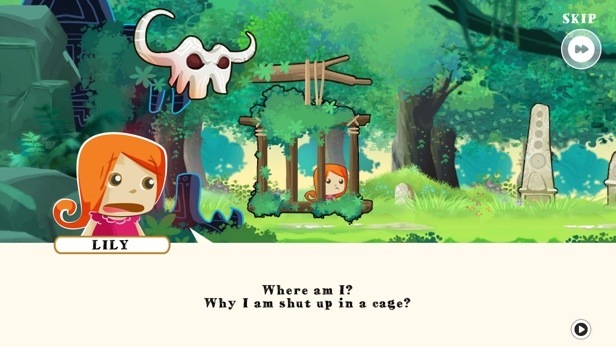 Little Amazon may be capable of entertaining the younger masses, but more serious gamers, such as myself and maybe even you, will be better advised to pass on this one. There are better examples in this genre to choose from. Sound Off: Now, folks, it’s your turn! 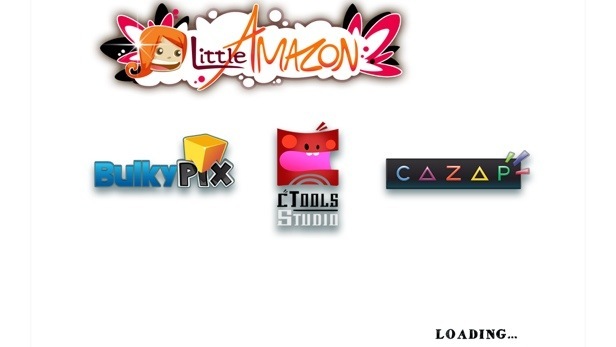 Do you have any thoughts, opinions, or general comments about Little Amazon and/or its developer, Bulkypix? I personally reply to every comment, and I’d love to hear what you have to say! Just take your cranial debris and throw it down in the box below, and happy downloading! Tagged 8, 8DAG, @ZTLaidlaw, Aholics, amazon, app, app-aholics, apple, Application, cell, cellphone, Days, endless, game, geek, ios, little, phone, review, runner, technology.